(AgapePress) – Crawford Broadcasting radio talk-show host Paul McGuire recently released his new book, Are You Ready? -- a compilation of facts and data along with scripture that closely relate to predictions in the Bible pointing to the Second Coming of Christ. This book is particularly timely as it comes during a period when, according to Christian researcher George Barna, the vast majority of evangelical Christians are demonstrating a reluctance to share their faith. Spreading the gospel is one of Christ's primary mandates conveyed in the New Testament. It is well-known among Bible-believing Christian educators that most believers do not have a Christian worldview of society and their place in it. The book alerts readers to the imminent dangers we face in today's society -- and the need to take the claims of Christ and the Bible seriously. McGuire's book chronicles a series of political, social, and military events that alert Christians to the relevance of the prophecies of the Bible. He outlines the real danger that terrorism and "Islamofascism" present to Western civilization. The book itemizes popular lines of thought promoted by leaders from the Middle East. The author explains how the Middle East got to its current crisis and why radical Islam is such a danger to America. 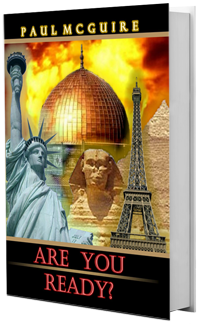 The book also makes a strong case why "the average person" simply does not realize that the entire world is resting on the edge of a world conflict in the Middle East, even after 9/11. Are You Ready? details past terrorist activities that most major media outlets glossed over in their reporting. In the book, the author communicates his concerns about the nuclear threat posed by al-Qaeda, Palestinian hate-indoctrination, and homicide bombers. All this should alert any American to the threat to our own public safety. The author skillfully intertwines the military and public safety threats to America along with the moral demise that American society has experienced during the last 50 years. McGuire outlines in the book why biblical moral issues are important to America. He contends that religious apostasy and the decline of moral authority of today's Church, along with the flood of filth in modern American culture, are warning signs to observers of Bible prophecy. Are You Ready? talks of the danger of America becoming a part of a regional government forum -- a controversial topic in today's highly charged political atmosphere. The author contends that "America is being placed into a global government. Mexico, Canada, and the United States are being merged into a common political, economic unit." McGuire continues to explain his contention, saying "there is absolutely no serious intent to enforce our border [security] .... The goal is to increase the flow of goods, services and peoples between those three nations. Eventually, all of South American and North American nations will be united into what is called 'the Americas.' This will be a mirror of the European Union ...." McGuire fills his book with quotes from high-profile leaders around the world to support his assertions. In an exclusive interview, McGuire says that in his book he "outlines a catastrophic [terrorist] attack on the United States. Anyone who does not think this is going to happen is dreaming."